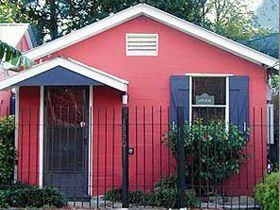 Music & Relaxing: The Little Eazy is located in a residential neighborhood just outside the French Quarter. We are located 3 blocks from the French Quarter and 3 blocks from Frenchman St (where the locals go to hear music). There are many up and coming restaurants in the neighborhood, yet you are a 3 block walk to the French Quarter. It is a quiet neighborhood as compared to the French Quarter. The Little Eazy guests like it because the cottage is comfortable like being at home, yet close enough to any of the fun activities which New Orleans has to offer. I fell in love with New Orleans on my first visit to New Orleans in 1988. After coming to New Orleans frequently I quit staying in hotels and preferred to have my own place. The Little Eazy was owned by Charles and Diana, and it became my second home on my visits to Nola. When I was talking to Diana one day, I told her I would love to own a house in New Orleans and she told me they were thinking of selling the Little Eazy. So my husband and I bought it and continue to run it as a guest house. I love owning it, I get to meet some very unique people. People who like to like to do things a little different, and who prefer to see a local view of the city. This is street parking and is FREE. I give you a parking pass so you do not get a parking ticket. Most of the time you can park right in front of the cottage. We do have a full kitchen, but there is NO stove. There is a full refrigerator, micro-wave, toaster, hot-skillet, toaster, hot plate and coffee maker. Outdoor private hot tub on the back patio. The "Little Easy" guest cottage was perfect for our week stay in New Orleans. We parked right in front and never had to move the car until we left at the end of our stay. It is only a short couple blocks to the French quarter and lots of wonderful music and food! With all that walking, we enjoyed the hot tub with a glass of wine every evening. That is so nice of you to write the review. Please come back anytime we LOVE repeat guests. Our stay was wonderful at Margaret's! She was very prepared and had lots of information for us about the city and side of town we stayed in available in binders and she was also easily accessible. We loved the hot tub and the music as well. The only small caviot I think groups of friends might want to know is about the shared bathroom, there is only a curtain, which made usage interesting between two if my girlfriends, me, and my husband. But we are all good friends and it didn't really bother us. Charming little place! This is a great location for accessing Frenchmen and the Quarter! We were able to park the car and leave it the whole weekend while we explored on foot and by trolley. The owners live next door and were super helpful. Very clean and had everything we needed. It's not the Ritz but it's comfortable, affordable, clean, and on a really nice block. We'll definitely be back!! Thank you Kimberly please come back I LOVE repeat guests! We stayed in the Little Eazy while visiting a relative who lives in New Orleans. This little house was in the perfect location, easy walking distance to Frenchman Street, convenient access to French Quarter. It provided a quiet, cool respite when we needed it on hot, humid days. Margaret kindly checked on our needs during our stay. I loved that she had the local radio station playing jazz when we arrived. It set the tone for our stay! Cool & easy. P.S. Don't be weirded out by the bathroom. It works! We'd stay there again and definitely recommend it. Thank you so much for your review. I have owned the Little Eazy for over 10 years and it was the place I LOVED to stay when I visited New Orleans. I am pleased that you enjoyed your stay, please do come back again, we LOVE repeat customers. The Little Easy is a wonderful place to stay in New Orleans. It's a short walk to Frenchman Street and the French Quarter. It's comfortable and roomier than I was expecting. The house is well-maintained and clean. My family had a great time staying there. The layout isn't perfect, with the bathroom in one bedroom and with a curtain for a door, but it wasn't that bad. I will definitely stay there again next time I bring the family to New Orleans. Thank you for your review, we are thrilled to have you stay at the Little Eazy, please do com back again we LOVE repeat guests. I am please to here you enjoyed your trip to New Orleans and the Little Eazy. New Orleans, Louisiana, USA (Close to the French Quarter-Faubourg Marigny Neighborhood.) - The Little Eazy is located in the lovely, historic 'Faubourg Marigny' neighborhood, just 3 blocks from the French Quarter and 3 blocks from Frenchman St. Close to the best live music clubs and restaurants in the city. Just blocks away from the Mississippi river and infamous French Market. Other Activities: shopping, drinking, music clubs and more!